Author: Brian Bingaman. Originally published by The Reporter. 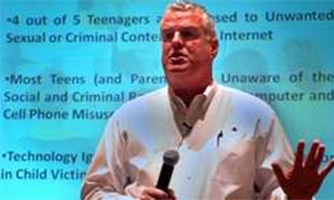 Telford Chief of Police Randall Floyd conducts the seminar “Social Networking:Friend or Foe” last year. Although Telford Borough Police Chief Randy Floyd spends a few weeks of the year out of the country, it?s not for rest and relaxation. Cleft lip and cleft palate are still a problem among children in several countries around the world because of the cost of corrective surgery. The issue is so prevalent that Rotaplast International, which was originally a project of the Rotary Club of San Francisco, has become an independent non-profit that makes 15 goodwill mission trips each year to dramatically change lives for the better. More than 10,000 cleft lip/cleft palate surgeries have been performed thanks to the organization. “I miss the kids down there. A great experience everybody should have is to go to a country like that to see what poverty really is, and see how good we have it here,” said Floyd, who was the team leader of a group of 28 plastic surgeons, anesthesiologists, nurses, dentists, speech therapists and other Rotaplast volunteers that traveled to Retalhuleu, Guatemala in March. Of the 500 families that came to a pre-clinic screening, 230 were reviewed and 106 children were successfully operated on. Last year, Floyd was in Bangladesh on a similar Rotaplast missions trip. He said that another trip is scheduled for the Philippines in November. “The hospitals are a far cry from (how they are in) this country. There were surgery tables propped up with blocks of wood and held together with duct tape,” said the Rotary Club of Harleysville member and Rotaplast missions director, who is depicted wearing blue surgical scrubs on the Rotaplast blog site. Adding drama to the proceedings was a malfunctioning autoclave – an important sterilizing device for surgical instruments. Salford Township resident and fellow Rotarian Don Heebner, who served as the ward coordinator on the Guatemalan Rotaplast trip, said that the well traveled, pressure cooker-like device was designed to remain in a doctor’s office, and not for constant air travel. A phone call to the manufacturer’s technical support, and what Heebner described as “MacGyver”-like tinkering, put the autoclave back in action. “There was this big volcano out beside the hospital. It looked like it was 25-30 miles away. The big joke is we were going to sacrifice that autoclave to the volcano,” Floyd said. Follow Brian Bingaman on Twitter @brianbingaman. For breaking news SMS alerts from The Reporter, text LANNEWS to 22700 from your mobile phone. Msg & Data Rates May Apply. Text HELP for help. Text STOP to cancel.